More than three million Florida residents live at or below the poverty line, and while Florida’s poverty rate of 14.7 percent is two points higher than the national average of 12.7%, many Florida residents still have trouble making ends meet. Florida’s median household income is $48,900, more than $7,000 less than the national average of $55,322, and the average Florida household is sitting on $5,700 in credit card debt. When poverty is combined with poor credit, emergency cash can be hard to come by, and when times get tough, impoverished Floridians who are unable to access more traditional loans or lines of credit are often forced to take out high interest payday or title loans in order to survive. Currently, borrowers are legally barred from taking out more than $500 in payday loans, but there is a bill making its way through Florida’s legislature that would double that maximum to $1,000. This is not a solution that helps Florida borrowers. There are more than 1.5 payday lenders for every McDonald’s in Florida. That comes out to 7 payday loan stores for every 100,000 residents. While that’s better than the national rate of 10 per 100,000, and MUCH better than Alabama’s rate of 26 per 100,000 residents, it is still concerning. 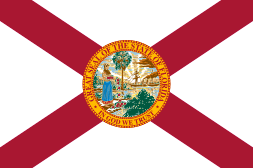 Currently, Florida’s payday loan laws are strict compared with many states in the union. As previously stated, the maximum amount a payday loan in Florida is allowed to be is $500, with a payback term of 7-31 days. If you were to take out a $100 loan on a 14-day term, your finance charge will be $16.11, and the annual percentage rate (APR) will come out to a wild 419%! Think that’s bad? It could get worse. The Consumer Financial Protection Bureau (CFPB) has proposed putting regulations on consumers who have taken out more than 6 short-term loans in a year. Currently, a third of Florida residents who use payday loans take out at least 12 per year, and more than 80% them take out at least 7 a year. Instead of living paycheck to paycheck, these people are living payday loan to payday loan. This well-meaning proposal from the CFPB is designed to protect Florida residents from Jacksonville to Miami to Tampa from falling into a debt trap they can’t escape from. However, the proposed rule has prompted the Florida Legislature to consider doubling the maximum amount of a payday loan from $500 to $1,000, and upping the term limit from 30 to 90 days. The title of the Florida Senate bill is “Deferred Presentment Transactions,” with “deferred presentment” referring to the act of writing a check dated in the future in order to borrow money now. Over the years, Florida has enacted laws to help protect consumers from predatory payday lenders. The most important law limits borrowers to taking out only one payday loan at a time. Everyone who takes out a payday loan is entered into the Deferred Presentment Transaction System, which, by state law, must be checked by licensed lenders before they issue a loan. If you’re already in the system, they are legally barred from lending to you, as you are only allowed to have one payday loan out at a time. The Florida Legislature has also made it illegal to rollover a payday loan into a new loan. This means if you have a payday loan out that you can’t afford to pay back, lenders are not allowed to offer you a new loan to cover the balance of your old one. This might seem like a bad deal for customers, but it helps prevent borrowers from getting stuck in a debt trap as more and more fees are piled on each new loan. Since fees in Florida are capped at 10% of the check amount, not being able to rollover a loan is good protection against mounting additional costs. However, a borrower can still open a new payday loan immediately after paying one off. If you already have a payday loan out and another lender agrees to give you a loan, or agrees to offer you a rollover on your current loan, this is a huge red flag that your lender is NOT licensed to lend in Florida. To verify that the payday lender you’re working with is licensed, check the Florida Office of Financial Regulation website. In order to lend money to borrowers, all Florida lenders must be licensed with the state. As stated above, all payday lenders in Florida need to be licensed under Florida statute Chapter 560. The Florida Office of Financial Regulation has a webpage where you can verify the license of lenders, but remember: just because a lender is legally registered doesn’t mean borrowing from them is a good idea. There is a reason Florida only allows consumers to take out one payday loan at a time: the combination of high fees and a CRAZY high APR has led too many Floridians into a financial hole. In order to survive month-to-month, they rely on payday loans, taking out a new loan immediately after paying one off. Repayment Plan::A grace period can extend the term to 60 days if the borrower enters credit counseling. While payday lenders loan money based on the cash you’ll earn on your next paycheck, title loans work a little differently. Title loans use something you already own and don’t want to give up – your car – as collateral for paying back your loan. The fear of losing your vehicle might motivate you into paying back your loan on time, but title loans are a dangerous game. Often, the fees associated with a title loan end up being greater than the loan itself. On average, a borrower pays $1,200 in fees on a $1,000 loan. Because people generally rely on their car to get to their jobs, title loan lenders are confident they will recoup these high fees. After all, what are you going to do? Without a car, you’ll be unable to work, and your already precarious financial situation will just get worse. And in Florida, if you miss a payment, the lender can take your car and sell it. Nationally, about 20% of people who take out a title loan have their vehicle seized. The “Florida Title Loan Act” was signed into law in 2000, but despite the interest rate caps imposed by law, lenders have found loopholes that allow them to increase their fees. One couple in Orlando was told they had to pay a “mandatory” $200-a-month insurance fee that was actually optional. After 4 months, they had made $1,400 in payments, yet still owed the full principal balance on their $2,500 loan. That same $200-per-month insurance forced a Florida woman to pay $7,000 over a 3-year period for a loan that was originally for $1,800. And she got off easy compared to the man who missed his first $300 payment, had his car taken away, and was informed he triggered a “buyback clause.” He could get his car back, sure, so long as he paid $7,000 to the lender. The amount he borrowed in the first place? Just $2,000. Title loan borrowers in Florida are protected by the “Florida Title Loan Act.” The amount of interest on a loan is determined by the size of the loan. Smaller loans have higher interest rates than larger loans. The first $2,000 of a loan has a maximum APR of 30%. The amount between $2,000 and $3,000 carries a maximum APR of 24%. After $3,000, the maximum interest rate is 18%. Be careful…the same loan can have different interest rates applied to different parts of the loan! If you take out a $3,500 loan, you are not limited to an APR of 18%. Since the APR is tiered, you can be charged an APR of more than 26%. Although the law on title loans in Florida was written to help protect consumers, lenders have found loopholes that allow them to continue charging outrageous fees, which can make what was supposed to be a short-term loan take a long time to pay off. Borrowers who take out a title loan often pay more in fees than they borrowed, and some end up losing their cars. Title loans are not worth the risk. Maximum APR::30% for the first $2000, 24% on the next $1000, 18% for any amount over $3000. Repayment Plan::None. Lender can reposses your vehicle for non-payment. Maximum Number of Days to Repay After Car Repossession::Lender must give 10 days notice before sale of vehicle, and you can get your car returned if you pay back your loan and any "resonable expenses." The laws that were designed to protect payday and title borrowers in Florida are only as strong as the consumers who fight against unfair lending practices. If you or someone you know has been taken advantage of by a lender, contact the authorities through one of the links below. And if you’re against the proposed legislation that would expand payday loans in Florida, contact your state representatives and ask them to vote no. Although the $500 limit on payday loans in Florida makes it seem like consumers are protected from bad loans, that’s not really the case. The maximum length of a payday loan is only 31 days, and the fast pace of the payback term can mean consumers may find themselves needing a new payday loan immediately after paying off the last one. As the Florida Legislature works on passing bills that would double the loan amount to $1,000, those people who can’t afford to pay back their $500 loans are in even more danger. The best way for consumers to protect themselves? Stay far, far away from payday loans and title loans in Florida.